Years ago I read some books by Larry Burkett relating to Biblical views toward money, possessions, etc., and the books were revolutionary for me. Completely counter-cultural. Dave Ramsey and his Financial Peace organization does much the same today and does it very well. This book encourages us to see that we have more than enough, that we have been richly blessed and we have more stuff than we need which can weigh us down. Culture tries to force us to make economic decisions that bind us while Scripture encourages us to make decisions that are liberating. Spending time and money on what matters most. I think the book used the terms radical generosity or radical contentment and in many cases what they are talking about is more radical than I am comfortable with. Not everyone can work at a non-profit and we can find ways to love God by serving our neighbor in whatever vocation or setting in life we find ourself. But it is a very interesting book and might prompt changes in how we view life and our possessions. Free is not your average manage-your-finances book, nor is it a live-as-an-acetic how-to guide. Mark and Lisa Scandrette manage their money, not vice versa. Their life decisions aren't managed by money, either!It has:Questions that help guide you to the root motivations/causes for your spending or saving habitsDiscussion guides for groupsFrameworks for thinking about your spending, budgeting, and savingDiscussion on some of the external impact of living more simply (environmental impact and global wealth, for example)Pastoral wisdom on dealing with root money habitsUseful for everyone regardless of what stage of life they're in. Matt and I worked through this book with another Christian couple in our age group. What I love about Free is that it isn't all about money and finances, it's about finding what matters most to you, individually, and seeing if your time and money align with those values. There is only one chapter actually about creating a spending plan! Despite its radical commitment to living "free" from consumerism, deadening jobs, and to live sustainably and generously, I was encouraged while reading this that my seemingly pie-in-the-sky goals are achievable; that I don't have to be totally radical to make concrete changes. Talking openly about our budget and income with another couple in a completely shame-free way was also immensely helpful. My experiments and goals after reading this: I am only going to buy used clothes and books for the next 12 months (no new clothes!) to use what has already been produced and lessen waste and also to be more conscious of where and how I spend. I am also going to pay off all of my student loans in less than a year by living off of one of our salaries and using the other to aggressively pay down loans and build up savings. Sounds crazy, but its totally possible. I read this book with a small group over several months, working through each chapter individually and then together. We found it helpful, honest and wise. It's hard to talk about money, but doing so in a group was therapeutic and encouraging. I'd suggest that readers take advantage of the short videos that the author has prepared for each chapter. They make great discussion starters, or else just reflection prompts if you're reading the book by yourself.One thing I appreciated is that the author divides the weekly tasks into several categories -- there's the bare minimum thing, the medium-time-sucking thing, and the "do this if you have lots of time and energy on your hands this week" thing. I was only able to do the Level 3 task a couple of times, but that's OK.I will likely read this again. A terrific discussion book for church groups. Has good suggestions for simplifying your life and how to set up and manage a budget. Good for thirty somethings, although the discussions around content are good for all ages. FREE: Simple concept. Mildly misleading title. The title does not imply being without cost. The book itself will actually run you $12.63 on Amazon. If anything it emphasizes the fact there is no free lunch and asks you to examine hidden costs like time and health. No... the freedom this book evokes is the freedom associated by learning how to consistently lay all your cards on the table and so that you can take a good confident breath knowing that in spite of all the other goals and messages being thrown your direction, that you are moving toward the ones that matter to you.As I said, this book is a fresh take on a (seemingly) pretty simple concept: spending your time and money on what matters most. Think about that sentence for a minute. Here it is again as a question: How can I spend my time and money on what matters most?What I most appreciated about Scandrette's approach in Free is that he does not start by imposing his value on the reader. Instead, the book begins by guiding the reader through the process of defining it for themselves. What ensues in a lovely but difficult internal dialogue as the reader will wrestle with the (if you are anything like me) dichotomy of their own lifesyle. I highly recommend you to lean into the discomfort this book brings with it. Don't just engage with this book at an academic level and give yourself a pat on the back for having been to a thrift shop earlier in the month. Participate in the exercises, and with a group if possible. I found the experience of this work to be very refreshing, and something I should be engaging at least on a semi-annual basis. Highly recommend this book. This book is a good reminder that, as the world's wealthiest, we have all we need. Our materialistic society communicates a message that the more stuff we have, the happier we will be. On the contrary, this book communicates that the more we adopt a lifestyle of simplicity, generosity, and purposeful living, the more freed up we will be to spend our time and money on what matters most. It's a great challenge to evaluate our own consumerist ideas and practices. Much of what the authors do and the way they live might be considered "radical", but one disclaimer could be this: One size does not fit all. Each person/family must decide what works best on their journey. A smaller house? One less vehicle? Giving away a portion of your income? Local and fair trade purchases? Thrifty shopping? Perhaps making less if that means doing what you love. Or, it could be somehow making a difference in your community. Whatever it is, each person must decide for themselves what will allow them to live simply, generously, and purposefully. If this interests you, then this book can ignite passion, inspire motivation, and provide encouragement along the way. Disclaimer: I didn't entirely read this book. We read and discussed it as a part of our longstanding home group. We had some really good conversations about money and how we spend both our time and money. The book suggests you go quite deep with your group members and discuss the particulars of your home budgets but our group opted not to do this. The book encourages downsizing - which always seems like a good idea! - as well as leaving within your means. I should probably read the book in it's entirety sometime. Well written and full of thought-provoking ideas. The Scandrettes approach their time and money in a refreshing and life-giving way that makes you WANT to consider living more simply and mindfully, even at great risk to your current comfort level. Everything they've tried isn't compelling to me personally, but that isn't the point of their story - they are passionate about helping readers to experience freedom by learning to put our time and money behind our values/purpose in life. I recommend this one. A challenge to live free in the use of time and of money. The Scandrette's have certainly not followed the American Dream, but their lives offer a counterexample of pursing meaning and service, set within a context of tools (checklists and questions and budgets) to offer self-evaluation and to promote intentional living. Perfect to approach the new year. Had I read this as a college student or 22 year old, this would have probably been the most eye-opening book of my life. Mark and Lisa live out the words on these pages, and if you're looking for a beginner's guide to living simply (within a judeo-Christian perspective), this is for you. I wouldn't recommend it on Kindle, though. I enjoyed this book but it was a tad extreme for me. It has many good points and the family is "with" the author in his search for simplicity in life and money and time and the ways we use what we have. He started early with his decision to live simply, yet he gives help for others further along the way who may want to make a change to the simple lifestyle. 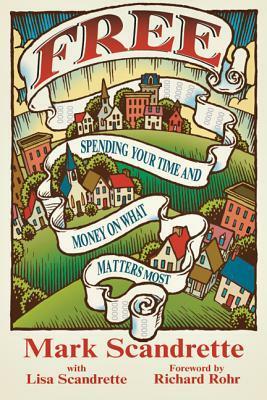 A good book that helps you clarify what is important to you, and are you spending your time and money towards that goal? This book has helpful exercises throughout to give you guidance on creating a plan for money, time, and other related subjects. I enjoyed this book and found several useful tidbits throughout it. This book is an epic adventures. Scandrette is challenging and kind and inspiring and tries hard to lay out logical steps to help Christians understand the relationship between faith and finances and how to find freedom for our deepest held values about time and money. Nicely written family's way to live more simply and describes how to get out of debt and manage your budget more wisely. A good read. I enjoyed this book - lots of wisdom and guidance for being more grateful, simplifing your life, spending time and money wisely - all with the focus on God. This is a bit of a dry read in some parts, however it truly changed the way I view resources. I think this book will have a lastly effect on our finances, and our life. This book really challenged me to rethink my finances and the way I spend my money. I hope to read it again and go brought the exercises with more time. Best book I've read on this subject in a long time! Practical yet mind expanding.